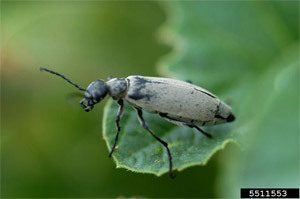 This is the famed Spanishfly beetle that produces cantharidin, resulting in a blistering effect that is especially problematic with horse feed. Adults are particularly attracted to alfalfa blooms, creating a serious forage health issue when transferred to stock feed. In the garden, they produce only minor plant damage, but their blistering effects are a health concern.